When making international money transfers, you’re usually required to enter the SWIFT code (or bank code for PayPal transactions). Just what are these codes and what are they used for? How can you find them? Fortunately, these unfamiliar codes are actually simple to decode. 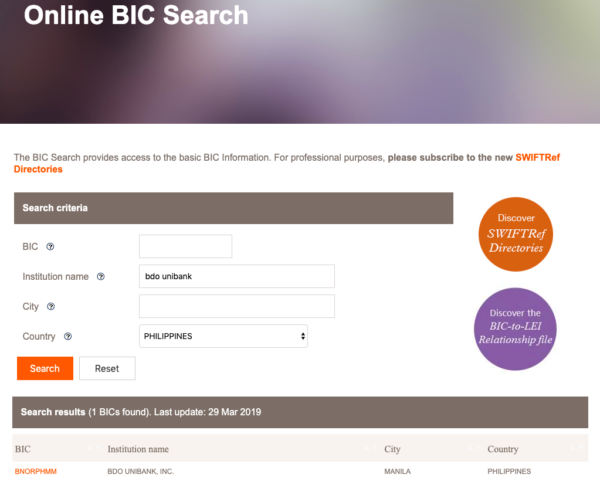 This guide provides everything you need to know about SWIFT codes and bank codes in the Philippines. The SWIFT code is an international code used for identifying business parties—usually banks—and routing financial transactions worldwide. This ensures that funds are transferred quickly and securely to the right bank. 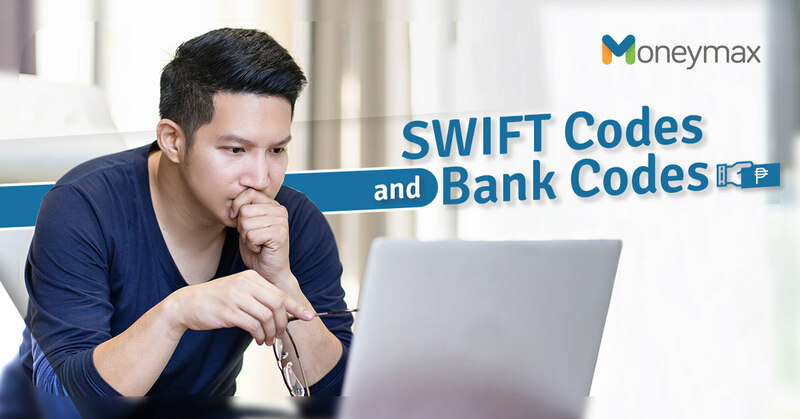 SWIFT stands for the Society for Worldwide Interbank Financial Telecommunication, a network based in La Hulpe, Belgium that manages SWIFT codes. When Do You Use a SWIFT Code? The BIC tells banks and remittance companies where to send the money. This is why you need this code each time you transfer funds internationally. If you’re sending cash abroad, you need to get the SWIFT code of the recipient’s bank before you can make a money transfer. On the other hand, if you’re receiving money from abroad, you need to provide your bank’s SWIFT code to the sender. Traditional vs. Online Money Transfer: Which Works Better for OFWs? It’s important to use the correct BIC because money transfers can’t be transmitted with the wrong code. To make sure you’re getting the right code, visit the SWIFT website and search for your particular bank. Choose “Philippines” from the “Country” drop-down menu. Alternatively, you may call your bank’s customer service hotline to ask for its SWIFT code. A bank code, also called the Bank Routing Symbol Transit Number (BRSTN), is a nine-digit code assigned to a bank used for identifying its name, city, and country in financial transactions. This code is the standard bank identifier for sending and receiving money in the Philippines. When Do You Use a Bank Code? The most familiar use of bank codes is withdrawing funds from users’ PayPal account to their local bank account. 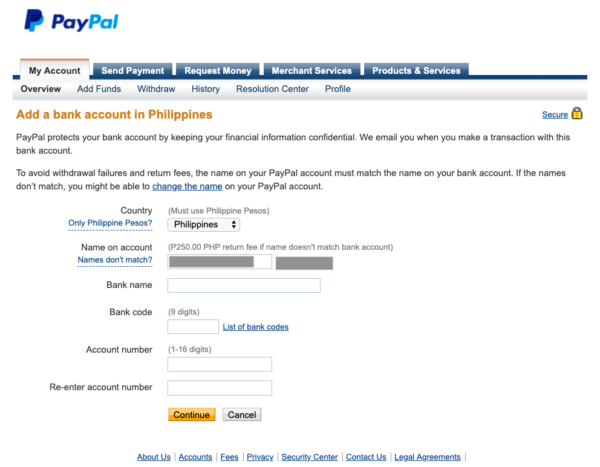 You probably first encountered the bank code when you added a bank account to your PayPal account for transferring funds. Click the “Wallet” link on the top menu. Click on the “List of bank codes” link next to the Bank Code field. However, it’s quite hard to quickly find the BRSTN on PayPal’s list. Here’s a more organized list that arranges banks alphabetically. Below, bank codes for the country’s top banks are listed separately as well for your easy reference. Can’t find your bank on the list? It could mean that PayPal doesn’t authorize withdrawals to your bank. Consider using another bank account or opening a new one. If you still can’t find your SWIFT code or bank code (or you’re having trouble completing your transaction using the code), call your bank immediately to verify the code and ask for assistance.